REVIEW: Run Photoshop on your Mac and paint using your iPad with the help of this clever remote-control app. Astropad is a superbly implemented app. When used with an iPad Pro and Apple's pressure-sensitive Pencil stylus, it gives you something that feels a lot like a Cintiq. There are quite a few iPad apps that enable you to remote-control your Windows or Mac OS computer from your tablet, but Astropad offers some clever creative twists. 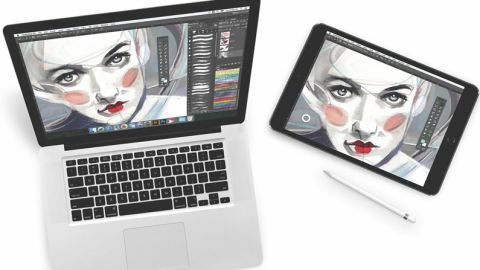 By adding some artist-friendly features, Astropad helps to turn your iPad into the equivalent of a Wacom Cintiq tablet, where you can draw directly on to your screen. Astropad relies on two pieces of software: an iOS app (which you pay for) and a companion Mac OS program (which you download at no extra charge). Get both of your devices on the same Wi-Fi network or connect them with a Lightning cable, then run both apps. With clear instructions on both screens, it's easy for the apps to find each other, and the contents of your Mac screen appear on your iPad. Now you can use Astropad on your iPad to control your Mac's actions. Unlike other remote-control apps, though, Astropad is geared towards the control of creative Mac software. Chiefly Photoshop, of course, but also any other painting or drawing program you care to run. Astropad overlays a circular button on the iPad screen. Tap this to access one-tap shortcut controls for your Mac software, such as changing the brush size. This update expands the range of software for which dedicated shortcuts are available, to include Autodesk SketchBook, ArtRage and others. But it's in the act of drawing that Astropad shines. Even on an ordinary home Wi-Fi network, there's no noticeable lag behind drawing on the iPad screen and the brush stroke appearing on the Mac screen. This is no mean feat. The developers, led by two former Apple engineers, created their own wireless technology to ensure screen updates were as smooth as possible. In this release, they claim it's three times faster than before. The replicated view of your Mac on your iPad looks nice and sharp, with colour reproduced accurately. You've got the option of viewing the whole Mac screen, which may mean black borders appearing on your iPad because of the differing screen ratios, or zooming in to view part of the Mac display. The latter option is great for when you're detailing. The drawback is that a 12.9-inch iPad Pro, a Pencil stylus and Astropad collectively cost £780, while a 13-inch Wacom Cintiq HD tablet costs under £600 online and – for now, at least – delivers a better drawing experience. So while Astropad is a superbly implemented app, its appeal rests on whether you already own an iPad Pro or want the extra benefits of one. This article was originally published in ImagineFX magazine issue 140, buy it here.